There’s training and then there’s training. In Kung Fu there is a kind of training that so challenges the way of thinking AND the body that people successfully ignore it for years and even decades. As Adam Hsu keeps reminding us, training for Kung Fu is not adding skills and strength onto what you already have. It is a stripping away of what you have probably decide was natural, but really isn’t. Kung Fu training starts with relaxation because otherwise nothing will change. You literally have to assume you know nothing about Kung Fu. In this case you are thinking outside the box and you are the box. This is a lesson that can’t be repeated. In all aspects of the world there are two basic training methods. The first is that you add to what people are already doing. Hop on the bike, start peddling, take the usual route to work, twenty minutes later hop off; essentially the same but now execised. The other, admittedly more difficult, approach is not progressive. Instead it moves backward, retrenching your foundation, laying new floors, excavating a new basement. 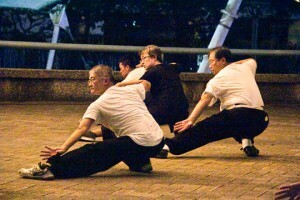 Martial arts, real Martial Arts, is therefore more troublesome for older people who have to un-live a lot of their past. But it doesn’t take 29 years if you are thirty( phew!). It does take thought and the wish to experience such changes for real. You want to erect a sky scrapper, start digging, as Sifu Hsu says. This is re-education that’s authentically Daoist in nature. It doesn’t require you to build muscle, compete with professional fighters, re-structure parts of your body. It does require you to think to relax; possibly harder practices than any mentioned above. In some ways this is particularly saw when it comes to children. They are often taught to be the robots that in reality that will be in thirty years time. People are extremely impressed when their little treasures can perform so well; with a deep stance, good erect form and lost of near-gymnastic flash. But as good as a seven year old can move, a perfect little imitation of the instructor, you will also note that the instructors are not much better than their child students. Sadly, they are still showing off exaggerated stances, rigid posture and other decorations. But, as in a good book or performance from a great actor, there should be something there that all the world’s youth cannot duplicate, an intelligence if you will. Kung Fu’s real training doesn’t reinforce what’s already been reinforced. You’ve got a dynamite right punch that you use to dominate your sparring partners. The only trouble is that it also dominates you; your plans, your skills, even you ambitions and goals. This is the dream of a teen ager who has been bullied too much. Kung Fu wants to return you to an earlier child-state where fears had not yet been born, habits did not encase and response was not so mechanized. All of this comes pretty directly (given its detour through me) from Adam Hsu’s fervent wish that Kung Fu returns to what it was for thousands of years, a method of re-mapping the individual and thereby re-discovering new areas. 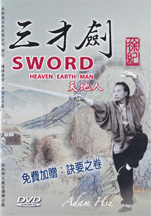 “Sword Polisher’s Record” the original feature columns that brought Adam Hsu to world-wide recognition as one of the martial arts best writers and thinkers. Originally published in Kung Fu Tai Chi Magazine. 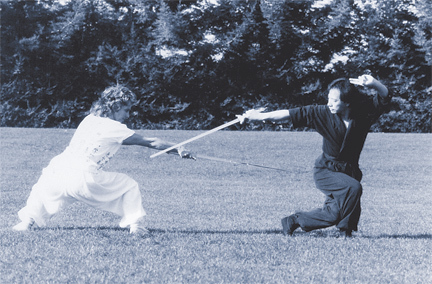 This is a long, in-depth and powerful article, and one of the most thorough presentations of the Kung Fu approach to basic principles ever published in the English language. Adam Hsu is the type of teacher who, even if you walk away with some reservations, reminds you that it is a pleasure to engage in something like a dialogue with someone who actually cares and does not grab the first and simplest explanation at hand. After decades of involvement in the art, I can only say that articles like this—which re-examine what everyone “knows”—are the ones that can alter a viewpoint in a moment—as fast as any punch. Other essays and books by Adam Hsu. 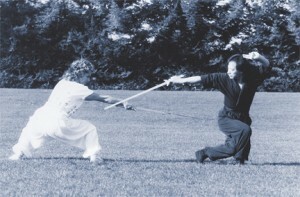 Here is the second part of Adam Hsu’s survey on the Kung Fu sword and its culture. As he has done some many times before, Sifu Hsu brings both a scholarly eye and a committed heart to his subject. He talks about the mysterious history of most sword forms, of how seriously they were practiced, the whole culture of the sword and adds a very heartfelt appeal that we not let this traditional technique vanish, despite the threats of the present. He also handles some confusing points like; is there a specific Baji sword or not? How do you tell what is the proper technique? Another “cut above” piece that makes you think. Adam Hsu has just produced a major DVD on the San Cai sword, a significant weapon routine which can be performed singly or with a partner. In this article—part one of two—he investigates the many mixed messages distinguishing “sword culture” from misleading symbols such as “sword dance” and theatrical Kung Fu. But the authentic weapon has had a culture all its own for over two thousand years. 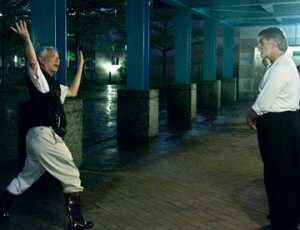 There are some real difficulties resolving the “dance” with the “martial” view. Confusion has now reached the stage where competitions are awarding championships to performers who know next to nothing about the sword’s heritage. All this is in direct contrast to the San Cai Sword DVD which teaches and demonstrates authentic usage with the straight sword. 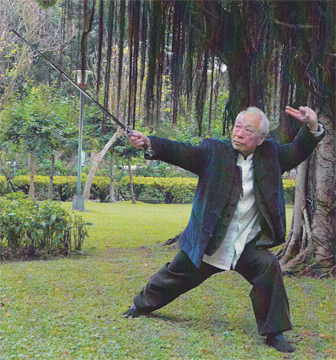 More than just knowing the Kung Fu form and usage, sifu Hsu has done extensive research on the history, construction, anatomy and manufacture of the sword. Click HERE for the first of two fine essays on this fundamental and artistic weapon. My instructors both have practiced Chinese martial arts for decades under Adam Hsu, and most importantly they are excellent teachers and coaches. It is not uncommon to see instructors out there who are great at their art with impressive competition records, but they can’t seem to pass their skills and knowledge to their students. IMHO an instructor’s teaching and coaching ability is a very important element in your martial arts success. 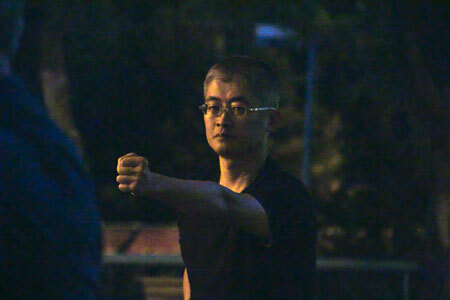 Mr. Adam Hsu is a world-renowned teacher of Chinese martial arts systems. 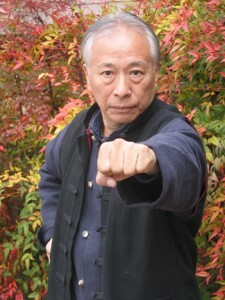 He is best known for publicly disseminating the Bajiquan and Piguazhang systems to the public, as well as his high level of attainment in the Yin-Fu lineage of Baguazhang. 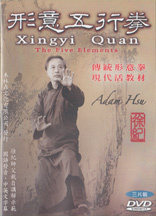 Master Adam Hsu has proven himself to be a master not only of the Chinese martial arts but of clearly projecting their essence through his writings. Sifu Hsu’s unique prospective of these high-level arts is long over due. He seems to get right to the heart of the matter, to the very core /foundation of these high-level disciplines. But his prospective reflects his command of his subject. My meaning is ” just because the art is complexed doesn’t mean it has to be presented in a mystical fashion”. If understanding is key to truth, education, and awareness, then sifu Hsu has made a contribution that we will only appreciate, fully in years to come. 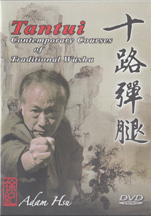 One of the most famous Kung Fu instructors in the world brings his teaching prowess to your home. Adam Hsu, widely recognized as one of the great teachers and writers in Chinese martial arts, brings his new virtual studio concept to everyone. His first three learning seminars are done in a multi-DVD format that brings you so much more than the basic movements. He goes through history, theory, personal views, teachers, and—most important—the very experience of learning from a master of traditional CMA. We guarantee the challengers and the feeling of practicing authentic Kung Fu will be absolutely unique.